The Cutting Edge of Ordinary: My first giveaway! October is my favorite month. Autumn is my favorite time of year. I adore everything Fall related…..apple picking, casseroles baking, soups simmering, warm cozy sweaters, nights by the fire, pies baking, bread in the oven, warm socks, hay rides, the gorgeous fall foliage we have here in New England, Halloween, Thanksgiving, and pumpkins! I am a pumpkin nut. Gimme pumpkin muffins, bread, cookies, or pie, if it has pumpkin in it, I’m a happy girl. I have a fantastic recipe for Pumpkin Pie Squares that I will be posting soon. It’s the ultimate pumpkin dessert and is served at my house every Thanksgiving. To celebrate my love of all things Fall (and today being the first official day) I decided to have my first ever giveaway. One of my favorite cookbooks is Dorie Greenspan’s Baking: From my Home to Yours. I think every baker should own a copy of this fabulous cookbook so here’s your chance to win it. (You can’t have mine cause it’s already flour dusted and filled with dozens of post-it’s). Not only will you get a copy of this great cookbook, but a few other goodies as well. 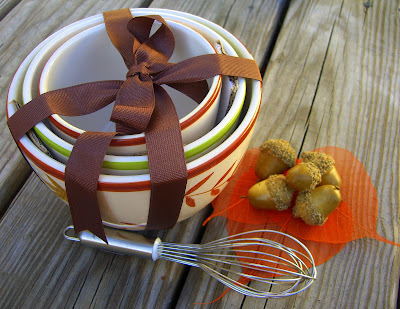 There’s a set of adorable fall bowls, a mini whisk from Crate & Barrel which is one of the handiest little tools I own, and some mystery gifts. I don't wanna tell ya everything! The winner needs to have a few surprises thrown in there! I’ll put your name in 10 times. Just let me know in the comment section or drop me an email (hit that little contact button off to the left at the top of the page). So if you read my blog but just never comment, here’s your chance to be heard and possibly win some cool prizes! Good Luck and Welcome Fall! I love raking leaves and havening the kids jump in them. My faves: the cool crisp air, colors, smells and the misty fog! I read your blog daily and check several times a day for updates. I found your blog through the GEFP. Thanks for a great read Lisa!! I love your recipes! Interesting giveaway, I sure could use it. Fall is such an awesome time. We can start the fireplace and it is more fun to bake in the fall, like I need another excuse to spend time in the kitchen. Ghenne, I read your blog, but I don't think I've ever commented. I love the recipes you post! Your giveaway idea is incredibly generous and very fun. My favorite thing about fall is the change in the weather. Just about the time we Bako Bits (folks who live in Bakersfield, CA) are absolutely sick of the heat, the fall comes along with its still sunny but much cooler days. I heart you, Fall. Pssst.....Anonymous!!! Who are you??? Let me know so I can add your name to entries! I can't wait for your pumpkin pie bar recipe. I think pumpkin is the ultimate fall flavor! The giveaway looks like such fun. I already own Baking, so I'll let some other lucky baker win it. It's the best! My favorite part of fall is the change of colors in the foliage, the crispness of the air and the onset of college football! My favorite things about fall are the beautiful colors and the cooler temperatures. I love having 'pumpkin flavored' everything. This is the time of year for seasonal flavors to start and I just love pumpkin! Thank you for hosting the contest, too! I love the availability of apples and pears in the fall. I love going to fall festivals, going on hayrides and buying freshly made apple butter (never tried making it myself). I love the colors of the leaves changing and though I do get sad that summer is over, I welcome the fun of school football and soccer games and all that goes with them. Thanks for all the great recipes you post! But I do miss the cripsness to the air. I loved the changing of the leaves. I loved drinking warm drinks while curled up reading a book or watching an old movie. Found your blog from a link from CorgiPants blog, and I've already picked out one of your recipes to try tonight - Maple Cream Cheese Pound Cake - yummmmmmm!!! If Canadian entries are allowed, I'd love my name to be thrown into the hat - thanks for a fun giveaway! Great blog, and wonderfull pics! My Favorite thing about Fall has to be the produce, Figs, Pumpkins, Squash, Pears, Apples. But them again, that's my favorite thing about any season! What a fabulous giveaway! I love Fall too, my favorite though is Spooky Halloween, I can't wait! Susan - thanks for posting the giveaway! Silverhartgirl - I love the jumpin' part, just not the raking! Christina - Thanks for stopping by, I love the crisp air too - that means sweater time! Wendy - Thanks for being a faithful reader! anonymous - I wish I knew who you were! Wanda - I'm glad you stopped by too! Lynn - your blog insipres me! I should be making that desert this weekend! Jenna - thanks so much for posting the giveaway. blueviolet - I am a football nut too! Shasta - boy do we have color here! bookworm - I love pumpkin too. You should see lots of pumpkin recipes coming up! heidi - Thanks for entering. I love everything you commented on too! pollynanna - my hubbie is from the desert, he's still getting used to New England. sandra - wow are you ambitious! Freezing your own pumpkin - I'm jealous! missjane - thanks for stopping by! I thought I recognized that name! noblepig - you and I both love Halloween. I think I love it a little too much sometimes! I love the cool, crisp air and taking the kids to the pumpkin patch and the apple orchard! Wow what a great give-away. Let's see what I love about Fall- cooler temps in Fl. Being able to sit outside with out bugs, baking more goodies, Halloween which is my anniversary, Thanksgiving with my family and watch my maple trees turn colors, yes we have them in Fl, lol. I have posted about your give-away on my blog. I too, found your blog through GEFP. I love, love, love your blog. However, now that I'm older (and not looking so much to the birthdays) I have come to appreciate autumn for many reasons. Summer's end cannot be mourned when you look forward to what Autumn offers. Autumn gives us time to reap what we've sown in the garden and enjoy the fruits of the labor spent under the summer sun. It's one thing to bake an apple pie, it's quite another when you've picked those apples yourself and baked them into your own creation. Autumn comes with its own pace. It's busy but not hectic. Oh sure, there are things to do (aren't there always) but there's real time to enjoy the season. Chores that can seem like work before you start can become fun when, for example, you try to rake all the leaves into one giant pile to jump into. There's a crispness to Autumn's air. Here in the northeast, the mornings might be chilly but by noon they've turned quite comfortable. The air smells clean and fresh and invigorates both mind and body. Autumn's colors, which no box of Crayola could ever duplicate, are brilliant and Nature’s showing off the true beauty of the season. Autumn teaches us a lesson: slow down, take a moment to enjoy the beauty and take another moment to say thanks. I love your blog. My fav thing about fall is Halloween. I love seeing the little kiddos dressed in such cute little costumes. I love feeling the changes in the air. Here it usually happens right around Thanksgiving. Clear cold days are something special. I love fall because it brings memories of the only thing my mom, dad, sister and I ever did as a family... The Great Pumpkin Hunt. We'd all load up in the car, drive to the North Fork of Long Island and spend the day hopping from farmstand to farmstand, picking up fresh fruits and veggies along the way. I'd always get a big bag of my favorite apples (Mutsu), and we'd get the biggest pumpkin we could carry home, which would later be carved into a giant jack-o-lantern. We'd stop at the 7-11 in Southold for hot dogs and hot cocoa for lunch, then on the way home we'd stop at Carvel in Mattituck (which is no longer there) for pumpkin ice cream. It was the most togetherness we had all year, and I cried the first year I was in WI and missed it. But my absolute favorite thing about fall is getting together with my girlfriends and going to Little Farmer. We buy apples, feed the goats, go on hayrides, go nuts in the craft barn and have gooey caramel apples. A perfect sunshiny, bright blue fall day with beautiful foliage, cool, crisp air, adorable livestock, the smell of some random campfire in the air, and fun times and memories with my best girls, who I don't get to see nearly enough - can life possibly get any better? I came over via "Pithy Title". I absolutely love this giveaway! My favourite thing about fall is actually something I've been missing out on for a few years - fall is when we start lighting the wood stove again. It's so much nicer for baking than the other options, but I'm at school in the city so I have to wait until the Christmas break. Here, one of my favourite things about fall is the farmers' market. I try to get there before the market actually opens because there's always a lineup for the grapes. I see some of the same people there every week. dawn - Thanks for posting on your blog. You're in 10 times! kamewh - we just took the kids for apples...pumpkins are next! cieangel - thank you too! Got you in 10 times too! caramia - your comment would make a great post! Loved it. ruby - I love Hallowen too! robin - cold, clear and crisp is my favorite weather! Kat - thank you girl! Crosing my fingers for you! pretzel - if you know Kat then you must be a good woman! Thanks for posting! illinlala - yes Canadians can enter. I can't forget our neighbors! Good luck! Just surfin' the blogs and found your giveaway. You should enter it at blogeventsdex.blogspot.com/. It is a cool blog that lists all kinds of giveaways and events. Then you should stop by and visit me at thebarberbunch.blogspot.com when you have time. Fall....oh how I miss fall. I grew up outside of Detroit where fall actually was a real season. The evenings and morning were on the chilly side, but the afternoons where gloriously warm with leftover hints of summer streaming down with the sunlight. The big maple tree down the block changed into a blaze of brilliant reds and oranges and yellows and the leaves ended up completely covering the sidewalk. Sunday afternoons could be spent at the apple orchard eating apples just picked from the trees and cider and those freshly made cake donuts. Ah how I miss fall. Now I live in Texas. Fall means that the highs are closer to 90 rather than over 100 and it might rain now and then. But you're still going to have to mow your lawn for another couple of months, you just won't think that you're going to melt into a puddle while you're doing it. It's a nice respite from the oppressive summers, but I really miss real fall. I love the abundance of late fruit... the huckleberries, peaches, blackberries, cranberries... It turns my head to the changes of seasons and from easy light meals to more hearty fare. It makes me nestle into my cave! Falling back aka time change get an extr hour of sleep baby! To me, fall means family get-togethers and I really enjoy that. Thanksgiving falls at the same time of year as deer hunting, so all the family heads north for the big deer hunt. I only get to see some of these family members once every year, and this is it. It's always a lot of fun catching up on what everyone has been up to. Won't be long now! Hi! This is my first time visiting your blog--but please count me in on the giveaway! I LOVE everything about fall! It is hands-down my favorite season. Unfortunately, it still feels pretty summer-like here--but I'm longing for the cooler temperatures, apple picking, knitting and wearing sweaters, fires in the fireplace, Halloween and Thanksgiving--basically all the stuff you said! I will write a blurb on my blog and post the pic tomorrow! My favorite thing about fall is the weather. I like that the air is fresh, crisp and clear, but not freezing yet. Me? I love the cool nights. Tossing on a few layers and heading out to walk under a bright moon with a clear sky. Leaves crunching underfoot. I'm on it like a bonnet! I heard about your giveaway over at Mamahuts and came straight here. You apple cake looks TO die for!!!!!!!!!! my favorite thing about fall is going back to school and snuggling up with friends. Awesome idea for a giveaway! Fall is my favorite time of the year for many many reasons. The color of the leaves, the smell of woodsmoke, the warm autumn jackets, the crunching sound when you walk along a field or road covered in leaves, hot apple pies, pumpkin muffins and going on hay rides, siting next to your sweety on a bleacher while the home town plays football... the smell in the wind of seasons to come. I posted about your giveaway on my blog..
i love that it's a repreave from the 100 degree weather. being able to take a nap with a blanket while the football game is on in the background. going to the pumpkin patch. that you can bake and warm up the house in a good way. i can wear a sweater! I love fall! When we carve jack-o-laterns, we roast the pumpkin seeds. I prefer mine salted, and I can just eat them by the handful. My favorite thing about fall would have to be waking up in the mornings and stepping outside, seeing the leaves all burnt orange and glowing yellow and the smell in the air. Can you smell it, it's crisp and cool and just feels like apple and pumpkin pickin time. Or if it was especially cool that morning, you can see your breathe when you first walk out the door. It's simply the best time of year. I could use some new baking recipes! My favorite thing about Fall is the colors! I love the colors of the trees and it's also time for me to put away my summer decorations and start warming up the house with reds, oranges, yellows and browns. My favorite thing about fall are the crisp autumnal colors: the oranges and golds and reds and browns. Reminds me of holiday spices! Fall has always been my favorite season, and nothing beats a cool, crisp autumn day to take a wander in the colorful leaves. I love sweater weather, and I am so anxious to get some of mine out! You have a terrific blog, yummy stuff and great pictures! I posted about this generous giveaway on my blog too! Thanks! I love that the changing leaves paint the mountains vibrant, beautiful colors. Even the drive to work is amazing. And I can finally break out of my summer-long baking hiatus! I've posted a link and your graphic to my blog, maybe my 1 follower will stop by too. Lol! I grew up on the beach in Florida, so fall doesn't usually start until Halloween day. That's seems to be the magical day when the temperatures drop and Autumn finally arrives. I also love making the kids' costumes and watching their excitement build to Halloween trick-or-treating or parties, buying candy corn and eating each color one at a time, and preparing a huge Thanksgiving feast for a group of family and friends. My s-i-l shared your blogspot with me, and I am so happy to find yet another place to find great recipes! I am new to this blogging thing but will try to post your giveaway on my blogspot as well. I love the cool air, the smell of leaves burning. It's my favorite season of all. I'm feeling lucky so please enter my name in your drawing. Hi Lisa! Like you, I love baking, and thus Fall is one of my favorite times of the year. It is full of excuses to bake anything from pie to cookies, to candy, and I could go on forever. I always love reading your posts and browsing your pictures. Keep up the good work! My favorite thing about Fall is the weather. The air is dry and crisp, it's cool enough to warrant a sweater or light jacket, but not too cold to play outside. What I love about fall is the food. I especially love that pomegranates are back in season. And who doesn't love and crave pumpkin pie? I love the pumpkin flavor things that show up but I love the foliage changing color! I grew up in NY and live in TX now. We still see color change but nothing like the north. My favorite thing about fall are the many changing leaves in the mountain near our home. And the smells of cinnamon. Oh, yea. I'm happy to post your blog give a way on my blog! Oh oh oh oh!!!!! Me! Pick me! My favorite thing about fall? Is it cheating to say all of it? The break from the heat, pockets full of acorns, and THE FOOD! My favorite thing about fall is the awesome cool weather and the leaves changing colors! Fall is all about the wonderful turkey dinner my wife will make. I look forward to this all year long. Our Thanksgiving feast is complete with lots of family and friends, I can't wait! My favorite thing about fall - my four year old's face jumping in the leaves. I have read your blog a couple of times before today -- I think I found you over on Pioneer woman. Your recipes sound great and I love the look of your giveaway. I have quite a collection of cookbooks, but not that one. I just started a blog but have not posted anything yet, and I have no idea how to link from one to another. Fall is nice where I live; some rain but warm days and cool nights and beautiful colors. Can't wait to see the results of your giveaway! How fun for your 1st giveaway Lisa! We'll be lurking around more often to look out for these events, we love to try to earn free stuff. You give the BEST gifts! Umm, speaking of gifts, a big BOX in headed your way! My favorite thing about Fall is all the baking and preserving of Nature's bounty that comes into our kitchen by either hard work or our friendly neighbors. It makes the whole house smell wonderfull for days on end. I love it.